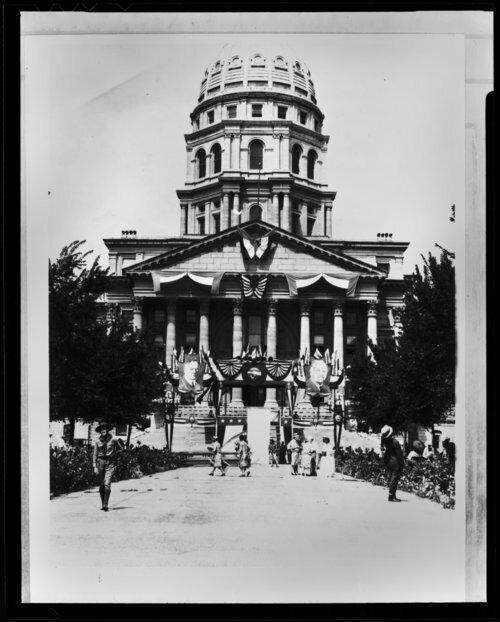 Two photographs showing Charles Curtis' notification ceremony at the Kansas capitol in Topeka, Kansas. The ceremony celebrated Curtis' nomination as United States Vice President. Curtis, a member of the Kaw tribe, represented Kansas in the United States House of Representatives,1899-1907 and Senate, 1907-1929. He and Herbert Hoover, the presidential candidate, were on a ticket which was victorious in November 1928, over the Democratic ticket of Alfred Smith and Joseph T. Robinson. Hoover and Curtis served one term before being defeated by Franklin D. Roosevelt and John Nance Garner in 1932.